We are proud supporters of the NSPCC and try to do all we can to raise awareness of their work and also raise funds to help their many good works. 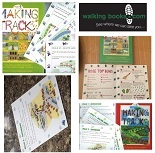 We have pledged to make a donation of 10p from every sale of our Making Tracks in the Yorkshire Dales book. The NSPCC Hikes Against Cruelty to Kids (HACK) are something that we are particularly keen to support and promote. Please take a look at the link and if you are able to help or even join in on one of the walks I am sure the NSPCC would be grateful.